One of the transport innovations that people have sought for decades is the flying car, but engineers have repeatedly struggled to combine the aircraft and car in a viable way. Up until now, that is. After much waiting, two flying cars have come along in the same week. First to be announced was US firm Terrafugia’s Transition, which last month flew at an altitude of 426 metres for eight minutes. The vehicle has two seats, four wheels and wings that fold up. It has a top speed of 112 km/h on the ground and 185km/h in the sky. You may question who would want such a vehicle now it is available, but around 100 people have already placed €7,500 deposits to receive a Transition when the first are produced. 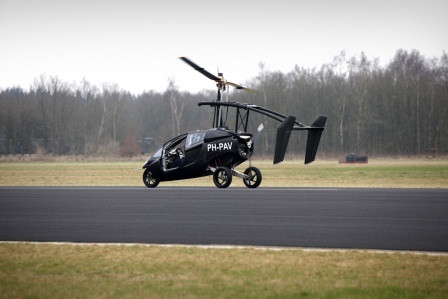 Meanwhile, across the Atlantic, Dutch company Pal-V (Personal Air and Land Vehicle) also reported the first successful test flights of its heli-car, which uses a rotor to fly and a propeller for propulsion on the ground. The one manned vehicle can be seen as the successor to the failed three wheeled vehicle the Carver, and uses the same tilting technology on the ground. The Pal-V has a top speed of 180 km/h on land or in the air, and has a 350-500km flying range. Pal-V is looking for investors and says potential lead customers include the police, the military, and flying doctors, who have expressed interest in using the vehicle for surveillance, mobility, aid in post-war situations, and homeland security. 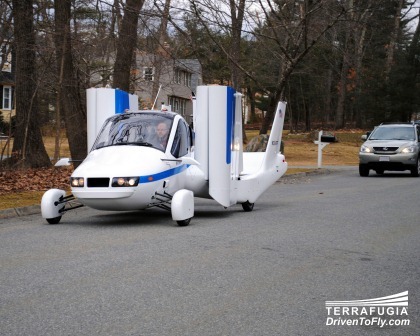 What is worth considering is how air traffic controllers plan to cope if personal air transportation takes off the way Pal-V and Terrafugia hope it will. Next articleWhat will the legacy of the 1,000mph car be?